Welcome to the home page for the law office of J. Nicholas Bostic. If you are here because you need an attorney, remember—there simply is no substitute for experience. The need to search for an attorney means you have already decided that you have an important matter to deal with. Take a few minutes to review the Practice Areas page to decide if I offer services in your area of need. Then take your time reviewing my background page. Once you are satisfied I can help, please contact my office. Fee arrangements are flexible and depend greatly on the type of problem. I am located in Lansing, Michigan and can easily attend virtually any court in the lower peninsula without additional charge. All criminal cases are important. Sometimes even a traffic ticket can have serious repercussions. From murder to annoying building code violations, you can defend yourself from charges brought by the government. For effective, thorough, tenacious and experienced representation, call and get the help you need. 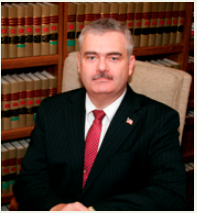 Since becoming a lawyer in 1987, Nick Bostic has litigated on behalf of the government and on behalf of individuals at all levels of state court and administrative systems as well as in federal district and appellate courts. Litigation experience combined with tenacious, thorough research and preparation has resulted in success on both sides of the courtroom. Criminal charges and government misconduct are very serious matters. The protection of your rights requires firm, rapid, and experienced representation.